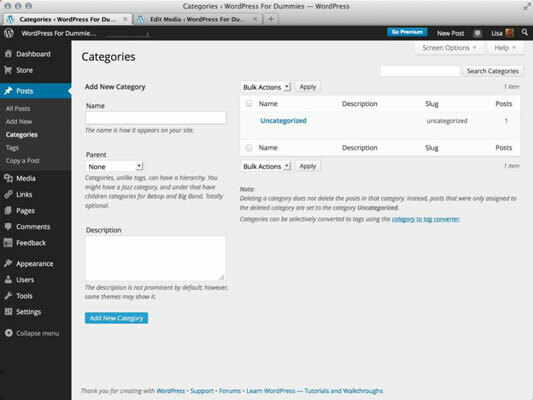 Categorizing your posts in WordPress provides an organizational structure for your blog. Each blog post assigned to a category is grouped with other posts in the same category. When your blog is a few months old, this structure creates a nice topical directory of posts for you and your readers. Category lists generally appear in two places on your blog, letting your readers find all your posts by subject very easily. Almost all WordPress themes list categories within the blog post itself. Most themes also provide a list of your categories in the sidebar of your blog so that your readers can click a topic of interest. Each category in a WordPress.com blog has its own RSS feed, making it easy for your readers to subscribe to a feed and keep updated on what you have to say in your blog about a certain topic. A brand-new WordPress blog has only one category: Uncategorized, but you can add as many categories as you want and can manage those categories on the Categories page on your Dashboard. Click the Categories link on the Posts menu. Under the Add New Category heading, type the name of your category in the Name text box. Leave the Parent drop-down menu set to the default option (None). The Parent drop-down menu allows you to create subcategories. If you have a main category called Books, for example, Books appears in the Parent drop-down menu. To create a subcategory of the Books category, follow Steps 1 and 2 and then choose Books from the Parent drop-down menu. (Optional) Enter a description of the category in the Description text box. Categories you create now aren’t set in stone. You can edit or delete them by revisiting the Categories page and clicking the name of the category you want to edit. The Edit Category page opens, and you can edit the category name, category parent, and description. Click the All Posts link in the Posts menu. The Posts page appears in your browser window, displaying a list of posts you’ve made. Click the name of the post you want to categorize. The Edit Post page opens, displaying your post content and saved options. In the Categories section to the right of the Post text box, select the check box next to the category or subcategory (you can select more than one category and subcategory) that you want to assign to the post. You can also use the Categories section before you publish a new post to assign it to the categories you’d like. Scroll to the top of the Edit Post page and click the Update button. WordPress refreshes the Edit Post page, displaying the post you just edited; it reflects the changes you just made.